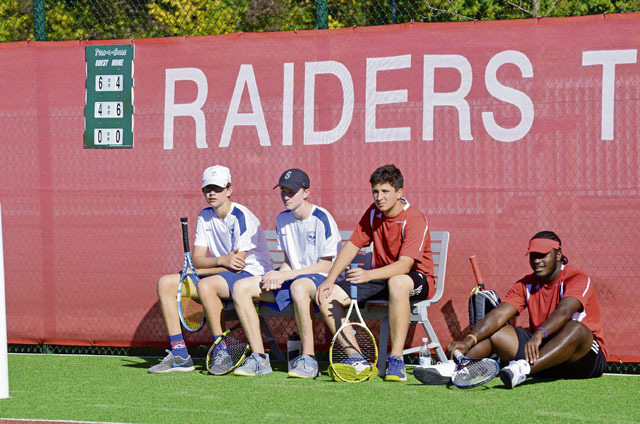 Tendencies held true when rivals Kaiserslautern and Ramstein met on the tennis courts last week. The KHS girls kept their hot streak going by dispatching Ramstein, but the Royal boys kept their big season alive by topping the Raiders. All four squads are in the midst of highlight-filled 2018 campaigns and there were big performances across both genders on a day where sportsmanship and friendships were held on high pedestals. The most competitive matches came in doubles, and both were won by Kaiserslautern. Aiva Schmitz and Giulia Sanchez needed a tiebreak to outlast the Ramstein pair of Ashlyn O’Connor and Isabella Guzaldo 9-8 (7-3). Ramstein had stormed back from being down by four games in that pro set match. On the far end of the new KHS courts, the Raider pairing of Olaitan Powdar and William Alsing secured a victory over Conner Markus and Collin Kent 6-4, 4-6, 10-7. The last tiebreak set was back and forth, drawing much of the on-hand crowd down to watch through the fencing. “These two schools are really well-represented in tennis this year and some of these players will see each other again at Europeans next week,” said RHS co-coach Katina Campbell. Kaiserslautern’s girls won thanks to singles wins by Schmitz, Victoria Lopez, Taylor Larned, and Shatavia McBride. Ramstein’s singles wins came from Delany Terry and Gabriela Ramirez. In doubles, KHS had a win by Larned/Lopez and Ramstein had Ramirez/McBride taking a point. On the boys’ side, Ramstein got doubles wins from Jordan Liebig/Aiden Pinkham and Conner Sankey/Collin Ritter. Mark Butler won at the No. 1 singles spot for KHS but Ramstein took everything else. Markus, Kent, Sankey, Ritter, and Pinkham each recorded singles wins over their Raider foes. Ramstein joins Alconberry this weekend in a three-team event at Lakenheath. Kaiserslautern will travel to meet Wiesbaden. The Europeans tourney is set for Oct. 25-27, also at Wiesbaden. Placing four runners among the top eight finishers gave Kaiserslautern the push it needed to win last week’s cross country meet at Stuttgart. The Raiders had the low total with 29 points, outdoing Stuttgart, Black Forest Academy, and Hohenfels. Stuttgart won the girls’ team title with 23 points, followed by Black Forest, Kaiserslautern, and Hohenfels. Stuttgart had six of its runners to wind up in the top 10 standings to carry the day. At another meet last weekend, Ramstein’s boys took first place with the low total of 17 points to easily outdistance second-place Baumholder, Wiesbaden, Brussels, and SHAPE. The Ramstein girls’ runners were just edged out by Wiesbaden, with SHAPE third, Brussels fourth, and Baumholder fifth. Ramstein will take its girls’ and boys’ squads to a meet this weekend at Baumholder while Kaiserslautern will be running at a meet in Wiesbaden. All DODEA schools get together at Europeans meet Oct. 26 on the Rolling Hills course at Baumholder. Paige Nielson and Izzy Coddington combined for 18 service aces to spur Ramstein to a pair of recent volleyball wins. The Lady Royals are now 8-0 on the season and can wrap up at least a share of the Division I DODEA regular season crown this weekend. Nielson contributed three kills in a 25-9, 25-8, 25-13 triumph over Spangdahlem. Masaya Archbold had five kills and two solo blocks in that same match, to go with six kills and two more solo blocks against SHAPE. Ramstein will be joined by Kaiserslautern (2-6) in matches both this weekend and next. The Lady Royals and Lady Raiders will be at SHAPE this weekend for a three-team rotating event and they will do the same next week with RHS and Black Forest coming to Kaiserslautern. Baumholder was unable to score any game wins against Black Forest recently. The BFA team won match one by a 25-19, 25-11, 25-21 count. Black Forest won match two by scores of 25-19, 25-13, 25-17. The Lady Buccaneers and Brussels will both travel to Spangdahlem this weekend for a three-team event. Kaiserslautern also fell twice in matches with Stuttgart and Vilseck. The loss to the Lady Panthers unfolded with scores of 25-13, 25-14, 25-18. That match was somewhat similar to KHS’s loss to Vilseck, which ended up 25-12, 25-15, 25-15. 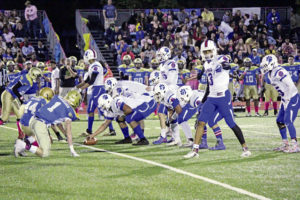 Ramstein (5-0) played in front a large Friday Night Lights crowd at Wiesbaden and had its mettle tested before leaving with a 28-14 win. Bailey Holland and Dominique Arizpe both rushed for over 100 yards and had three of the team’s touchdowns in a game that was locked 7-7 at halftime. Naser Eaves had a big kick return to set up a score and Ramstein got another score on a short blast by quarterback Jakob Steinbeck. Hollenbeck also praised the defensive play of defensive back Jason Jones Jr, the 10-tackle night by Holland, the fierce hitting by Kyle Lloyd. Ramstein travels to Vogelweh on Saturday to meet rival Kaiserslautern. The Royals seem to have the top seed locked up for the upcoming postseason playoffs, but the other three semifinalists are not yet ordered. Kaiserslautern (2-3) missed a golden opportunity to nail down a DODEA playoff berth after leading 18-0 but losing the advantage. A postseason berth is still possible regardless of whether the Raiders win or lose Saturday against Ramstein. Just like earlier, when KHS opened a big lead against Lakenheath, it was a late first-half drive by Stuttgart that stole the momentum. Alec Kenfield threw three touchdown passes to Sabriel Ashley and the defending DODEA champs made sure they would have something to play for this weekend. All-Europe designate Corey Coombs ran to daylight again for Kaiserslautern, with 36 totes for over 200 ground yards. He and the rest of the Raider charges were pressed by coaches this week to put the Stuttgart game behind them and plan for Ramstein’s visit. Vilseck and Wiesbaden are all but eliminated from the postseason race and the outcome of the rivalry game Saturday might affect the final seeding process.